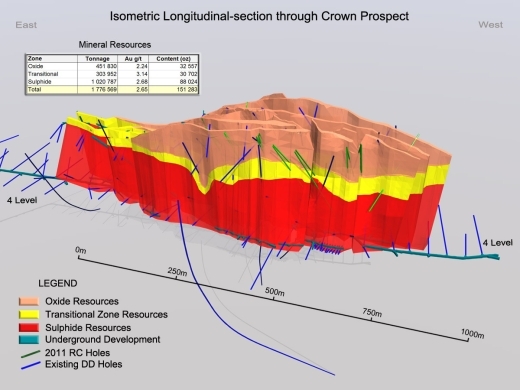 Results of a geological modeling exercise of the Mineral Resources at the Crown Prospect, located within the Barbrook Mines Complex, indicated the potential to bulk mine an array of mineralized shears, both in the oxidised zone and from underground. A scoping study was completed in 2011, which evaluated the viability of open pit mining of oxides and processing them on site. The study was based on the concept of delineating sufficient oxide ore to justify installing a mobile gravity concentrator. This necessitated a reverse circulation (RC) infill drilling program as well as metallurgical test work to ascertain whether the ore is amenable to gravity concentration. A total of 4051 meters in nineteen RC boreholes were drilled into the area above 4 Level, which is approximately 150m below surface. The objective of the drilling program was to define the oxide/sulphide interface and to enhance the definition of the potentially bulk mineable Mineral Resources. After incorporating the RC drilling results into the existing drill core sampling data base, a revised block model was completed for the area above 4 level, which indicated an upgrading of the Mineral Resources to 1.777 Mt @ 2.65 g/t or 151,000 oz (at a 1.0 g/t cut-off). These Mineral Resources include oxide, transitional zone and sulphide material. They are in addition to the Mineral Resources previously defined for conventional, selective mining below 4 level. Collectively, the total Mineral Resources at Crown amount to 2.12 Mt @ 3.14g/t. Unfortunately, the metallurgical results were disappointing in that the concentrating test work indicated that it is not feasible to process the oxide portion of the Mineral Resources using a mobile gravity concentrating plant. Consequently, the scoping study has shown that it is not economically viability to treat only oxide material by open mining methods using a processing option which does not require significant capital expenditure. Other alternatives for mining the sulphide material from underground and treating it at the Central Metallurgical Complex will be investigated during the Barbrook Stage 2 investigations.